It’s a beautiful fall Sunday. Windy, but sunny. I like sunny. And, the anxiety earworm is taking a nap today. I woke to a hum that all writers long to hear–a reader likes our work. That’s one tune, a happy little worry chasing melody. The next track on our preferred playlist is that the reader not only “likes” our book, but also deeply understands the craft and artistry of the work. That’s more than a melody, it’s a multi-layered composition. It can be listened to for quite a long time before it becomes monotonous. Somebody gets our art. Track three is the gift that keeps on giving: a lovely review that will be read by many, many other people. I am singing to visions of the book section spread out on tables, coffee cup at the ready, interest peaked, and the promise of ongoing conversations. And just to be fair, I have equal appreciation for virtual forms. 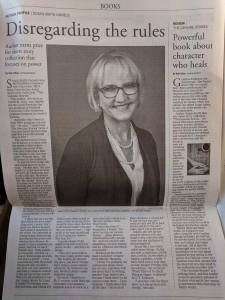 Many thanks, Rob Cline and the Cedar Rapids Gazette for the review and also this interview. And, just for fun, here’s the original Sunny by Bobby Hebb.